The Spitbucket Sessions are all about desmystifying wine, one glass at a time. 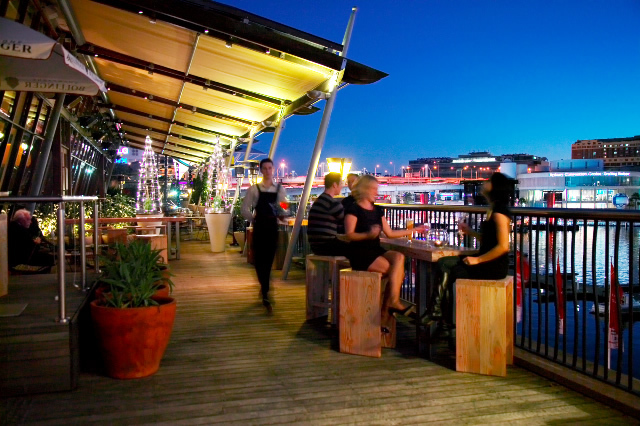 They take place every fortnight on the beautiful Roof Top Bar at Coast Restaurant in Sydney. The idea is to get people together over a few bottles of wine in a relaxed atmosphere and taste through them. There’s no pressure to say anything or have any prior knowledge about wine; just come along with a thirst and an interest. There’s no science to how the theme to each session is decided. It could be a grape, a region or one particular winemaker. I might bring some wines along, or we might welcome a visiting winemaker, or we could open it up to a winery active on Twitter. If you’re passionate about something then feel free to suggest a topic yourself. Spitbucket lives unashamedly with one foot in the real world and the other in social media. In our first Session, tasters happily chatted and tweeted away, allowing others to join in the conversation about the wines from afar. Hopefully we’ll have winemakers take part when we taste their wines, wherever they might be in the world. The tasting is also promoted via Twitter so that a wide variety of people are invited. The #spitbucket hashtag is where the magic happens! WHEN: Every other Wednesday. Dates coming up: 6th Oct, 20th Oct, 3rd Nov, 17th Nov, 1st Dec etc. WHAT’S NEXT: Deciding on the tasting topic is a haphazard affair. I’ll try to have the topic and some of the featured wines posted on the main blog by the Wednesday before each Session. HOW MUCH & HOW MANY: The tasting is free and I hope we’ll get 20 tasters at each Session. WHAT DO YOU NEED TO DO: Just tweet @coastrestaurant to reserve a place. If you aren’t into Twitter then find a friend who is and press-gang them into it! Please add me to your newsletter – great work guys! Thanks Darren – just got the email through saying that you’ve successfully subscribed to the newsletter. Hope you enjoy it!